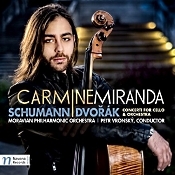 Carmine Miranda, cello; Petr Vronsky, Moravian Philharmonic Orchestra. Navona Records NV6034. You've probably heard me ask this before but the question bears repeating: How does the average music buyer keep up with all the new and upcoming young artists there are in the classical field? I mean, for over forty years I've been lucky enough to receive promotional discs or at least monthly release sheets from virtually every classical record company in the world, yet every month there are still names that pop up who are apparently famous to everyone but me. A name like Carmine Miranda, for instance. Of course, my being a certain age, the first person I thought of when I saw the name was Carmen Miranda, the "Brazilian Bombshell" actress and singer of the 1930's and 40's. 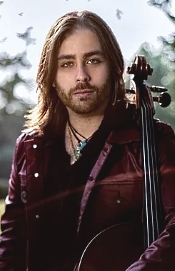 But nope; this is Carmine Filippo Miranda, the Venezuelan-American cellist, soloist, and recording artist who was born in Valencia, Spain in 1988 to Italian immigrants and who moved to the United States at an early age, winning awards galore before recording several albums. The current disc is the young cello player's first concerto recording, and while competition in Schumann/Dvorak repertoire is intense, he does a decent job keeping up with his rivals. In fact, in the Schumann concerto he practically dominates the field. It's in the more well-known Dvorak concerto that he runs into a little trouble, with people like Starker (Mercury), Gendron (HDTT), Wallfisch (Chandos), Rostropovich (DG), and Ma (Sony) tending to overshadow him. Still, with a fine-sounding recording, a highly personal approach, and veteran conductor Petr Vronsky and the Moravian Philharmonic accompanying him, Miranda is worth one's consideration. Miranda begins the program with his interpretation of the Concerto for Cello and Orchestra in A minor, Op. 129 by German composer Robert Schumann (1810-1856). It's something of an odd work, written in the traditional three movements but played without interruption. Because of its many fits and starts and because Schumann wrote it at the end of his career, most people consider it an erratic product of the composer's agitated mental state at the time (he died shortly afterward in an asylum). Most people. Not so Mr. Miranda, however. He sees the work as a kind of cryptographic love letter from the composer to his wife, a testament, says Miranda, of his "desire to unify himself with his wife through music. His ability to clearly and carefully infuse meaning into every section of the entire piece is impressive." As such, Miranda plays the piece as lyrically, as rhapsodically, as romantically as possible, which may leave some listeners a bit confused but certainly adds to the charm of the music. Miranda works to its fullest the idea of the score being a love poem to Clara Schumann, the cellist's interpretation producing a sweet, soaringly beautiful realization. This is evident from the very outset when the cello speaks eloquently, plaintively to the orchestra (whom, one supposes, represents Clara), and especially in the second movement, which is heart-meltingly moving. It's basically a romantic conversation between the two, and it comes off quite vividly, almost as if you could hear the words they're speaking to one another. It helps, too, that Miranda produces a lovely string tone, rich and expressive, and that the orchestra under Vronsky accompany him with their own emphatic and sympathetic gestures. It's a fine group effort all the way around. Then we come to the Concerto for Cello and Orchestra in B minor, Op. 104 by Czech composer Antonin Dvorak (1841-1904). As I said a couple of paragraphs above, there is intense competition in the field, and Miranda doesn't really add much with his performance that we haven't heard before. The Dvorak contains a plentiful supply of tunes, giving Miranda a lot of room to display his talents. Yet, beyond the cellist's obvious virtuosity, he seems content merely to play the notes, giving us a realization of poise and dexterity but little real inspiration. While tempos appear about average for this music, the speeds seem slower somehow. Perhaps it's because of the lack of energy behind both the orchestra and the soloist that nothing comes off with as much punch or authority as one might like. Anyway, the highlight of this album is the Schumann, which often takes one's breath away with its gently passionate interplay. There are already enough recordings of the Dvorak concerto, anyhow. Producer Vit Muzik and engineers Jan Kosulic and Ales Dvorak recorded the album at Reduta Hall, Olomouc, Czech Republic in June 2015. The sound is very clean, super clean in fact, with excellent detail and definition. The depth of image appears somewhat limited by the closeness of the recording, but it's hardly an issue when the rest of the sound is so good. The cello also seems somewhat too close compared to the rest of the ensemble, but, again, not really an issue. The cello tone I described earlier shows up to it fullest and sounds most realistic.